The Verve Pipe Album reviews. The Verve Pipe: This is Your Life! The Verve Pipe. If all that comes to mind is a vague remembrance of their smash hit "The Freshmen" you are missing out. Back in 1996, with their major label debut Villains, this Portage, Michigan quintet proved their worth in the music scene. Villains was an excellent pop/rock album, an album which went platinum. In fact, "The Freshmen" was such a popular track that the band had to release two versions of the album, the second featuring the radio version of the aforementioned song. Now, in 1999, Brian Vander Ark (lead vocals) and company are back to prove that Villains was no fluke. The new album, The Verve Pipe, marks the band's second major label release, but their fourth release overall. Before Villains the band had two independent releases: I've Suffered a Head Injury (1992) and Pop Smear (1993). Perhaps the best analogy for this album lies in the liner notes. Not in what they say, but how they are arranged. 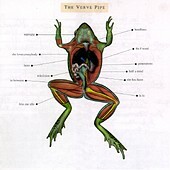 The cover of the album is a cross cut diagram of a frog that could have been lifted straight out of an anatomy textbook. Inside the notes we have more pictures of the frog, along with transparent overlays labeling the frog's various organs. The interesting part is that the organ labels are song titles , lyrics, and band members. This album is an anatomy of a band, and each song and member has a specific function in the band's life and inner workings. Through our tour of the band's internal organs, we get a feel of what they have experienced in their lives. Unlike many bands, The Verve Pipe do not give us a list of complaints about how hard it is to be a rock star. Instead, they give us a commentary on what has happened along with a feel for how the events have affected them. They place blame on no one but themselves for the problems they experience. This is made clear on the album's opener, "Supergig." ("We used to care, we don't care anymore") Referring to himself as a "Creep from the cradle and a hero driven wannabe," Vander Ark humbles himself and comes to terms with low self esteem on the album's first single "Hero." Unlike many bands in the pop/rock genre, The Verve Pipe have released a work that deserves the title of an album. This is not merely a collection of pop songs, but it is instead a journey through the inner workings of five men over eight years. The musicianship has undergone noticeable improvement since the last album, as has Vander Ark's vocal style. The band truly comes together on this album, displaying modest emotions in tracks such as "In Between" which works as a turning point from the upbeat pop the album starts with to melancholic soul searching. The Verve Pipe is an excellent title for this album, as that is exactly what the album is - an album about The Verve Pipe. By far one of the most intimate pop albums released (intimacy alone being a rarity in pop), the band takes us to its heart and lets us in. By listening to the album, the listener can experience everything the band has experienced. The powerful feeling of being loved by everyone, the fear of having no one at all, and the defeating realization that it is our own choices that make us who we are... creep or hero wannabe.